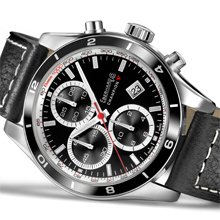 For over one century, Eberhard & Co. watches have born witness to man’s history, accompanying him in his endeavours to challenging the sky, the sea and his own limits. At the start of the 90s, the Swiss Maison launched the Champion collection, which it is reinterpreting today, retaining its original charisma, while giving it a more contemporary look. Elegance, refinement and sportsmanship are the characteristics of the new Champion V, a mechanical chronograph with automatic winding, whose style and technology blend together in harmonious versatility. Dedicated to the dynamic and sporty man, Champion V comes in different versions of dial and bezel that give it a distinctive personality and class. Waterproof to 5 atmospheres, housed in a 42.80 mm steel case, with convex sapphire crystal, the back is secured by 6 screws and embellished with a contrasting shiny and satin finish, and its steel bezel has a circular aluminium insert treated with “eloxage”. It offers a choice of wristbands: a leather strap with the buckle personalised “E&Co.”, or a steel “Chablis” bracelet. Eberhard & Co. Champion once again, in fact, Champion V! calibre ETA 7750, mechanical chronograph with automatic  winding, 3 counters: 30 minutes, 12 hours and small-seconds. Date at 4 o’clock. - blue with blue counters, counters profile and flange in white colour. Indexes - depending on the dial versions: rhodium-plated, satin-plated or ruthenium. Luminescent  (C1).